Download "How Will I Get Income from My Annuity?" 3 for the life of the annuity owner. The issuing insurance carrier bears all of the investment and longevity risk on the guaranteed payout, which means that the consumer is completely protected from these risks. Some annuity carriers even provide for the income to substantially increase in the event that the annuity owner becomes confined to a nursing home, further sheltering the owner from risk. In addition, the customer retains access to the annuity s remaining value while continuing to reap the benefits of interest credited to the annuity s value. 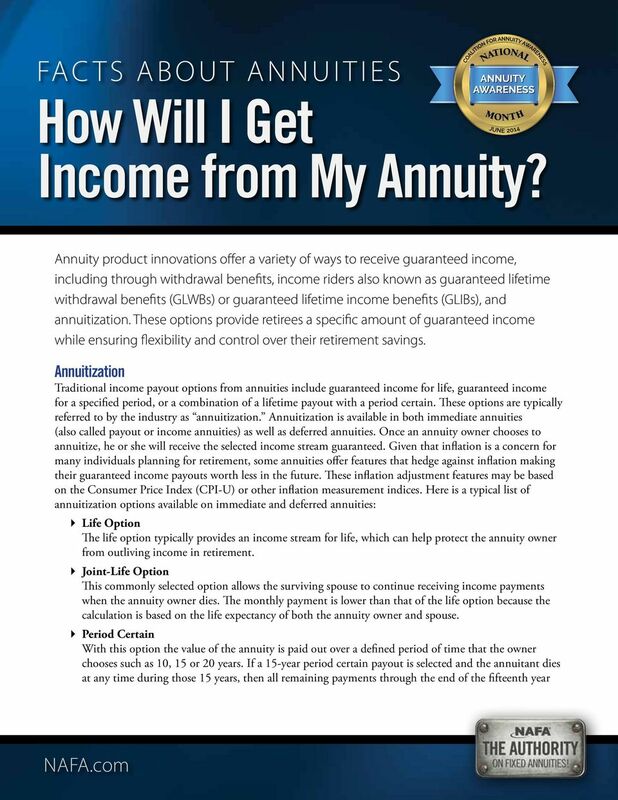 How Income Riders Work As previously noted, a guaranteed lifetime income or withdrawal benefit is typically optional on a fixed annuity, and it is added to the annuity by a rider. 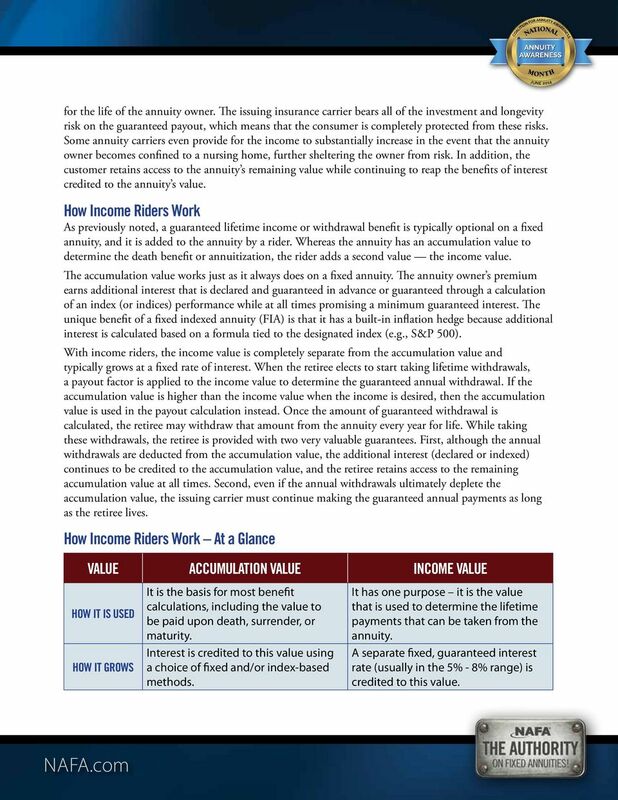 Whereas the annuity has an accumulation value to determine the death benefit or annuitization, the rider adds a second value the income value. The accumulation value works just as it always does on a fixed annuity. The annuity owner s premium earns additional interest that is declared and guaranteed in advance or guaranteed through a calculation of an index (or indices) performance while at all times promising a minimum guaranteed interest. The unique benefit of a fixed indexed annuity (FIA) is that it has a built-in inflation hedge because additional interest is calculated based on a formula tied to the designated index (e.g., S&P 500). With income riders, the income value is completely separate from the accumulation value and typically grows at a fixed rate of interest. When the retiree elects to start taking lifetime withdrawals, a payout factor is applied to the income value to determine the guaranteed annual withdrawal. If the accumulation value is higher than the income value when the income is desired, then the accumulation value is used in the payout calculation instead. 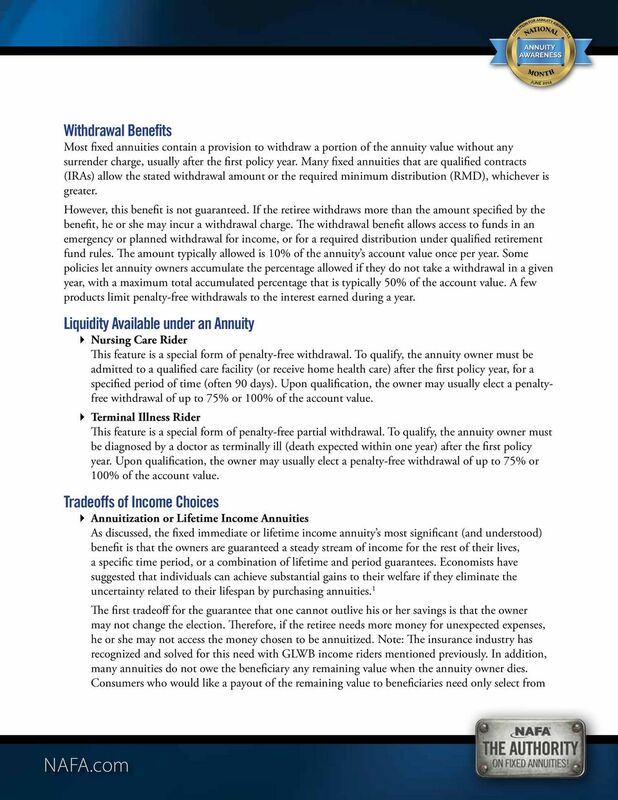 Once the amount of guaranteed withdrawal is calculated, the retiree may withdraw that amount from the annuity every year for life. While taking these withdrawals, the retiree is provided with two very valuable guarantees. First, although the annual withdrawals are deducted from the accumulation value, the additional interest (declared or indexed) continues to be credited to the accumulation value, and the retiree retains access to the remaining accumulation value at all times. Second, even if the annual withdrawals ultimately deplete the accumulation value, the issuing carrier must continue making the guaranteed annual payments as long as the retiree lives. 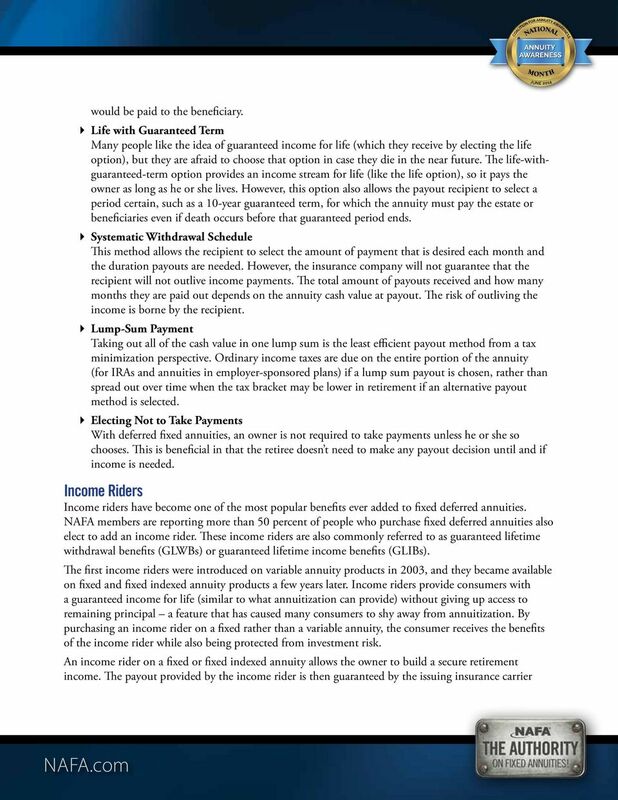 How Income Riders Work At a Glance VALUE ACCUMULATION VALUE INCOME VALUE HOW IT IS USED HOW IT GROWS It is the basis for most benefit calculations, including the value to be paid upon death, surrender, or maturity. Interest is credited to this value using a choice of fixed and/or index-based methods. It has one purpose it is the value that is used to determine the lifetime payments that can be taken from the annuity. A separate fixed, guaranteed interest rate (usually in the 5% - 8% range) is credited to this value. 5 the products that offer this benefit and, in exchange for the benefit, accept a lower income stream than they would have received otherwise. Charges for Income Riders Income riders attached to a deferred annuity provide consumers with more flexibility to access their remaining annuity value if/when they need money for unexpected expenses. However, that flexibility comes at a cost. While the income riders guarantee lifetime income or withdrawal amounts that add a valuable benefit to the fixed annuity for retirees interested in a reliable retirement income, the riders are not free. 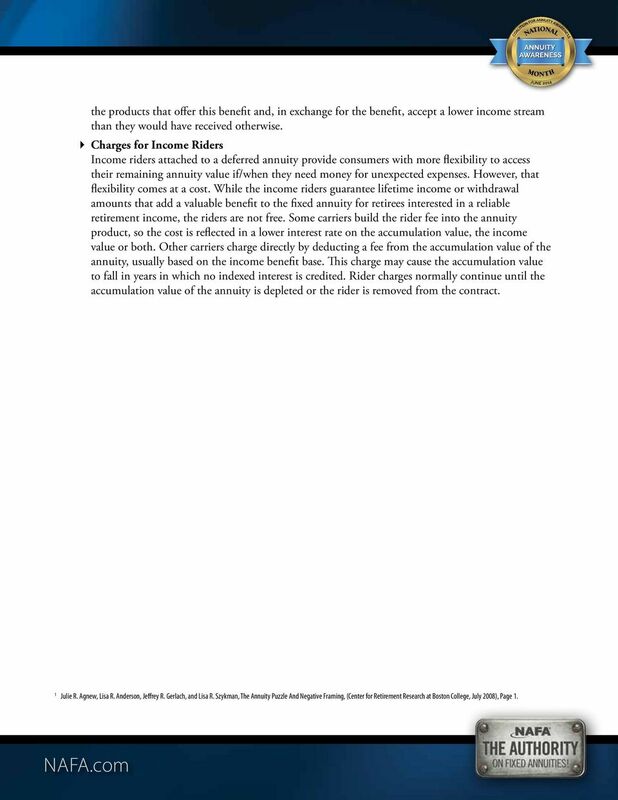 Some carriers build the rider fee into the annuity product, so the cost is reflected in a lower interest rate on the accumulation value, the income value or both. Other carriers charge directly by deducting a fee from the accumulation value of the annuity, usually based on the income benefit base. This charge may cause the accumulation value to fall in years in which no indexed interest is credited. Rider charges normally continue until the accumulation value of the annuity is depleted or the rider is removed from the contract. 1 Julie R. Agnew, Lisa R. Anderson, Jeffrey R. Gerlach, and Lisa R. Szykman, The Annuity Puzzle And Negative Framing, (Center for Retirement Research at Boston College, July 2008), Page 1.